Woodpeckers is a private house in the New Forest, designed as a two-storey replacement for a 1930s bungalow. 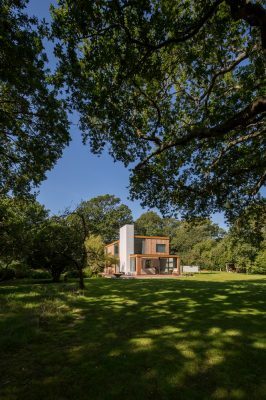 The site sits amongst fields and woodland just outside the National Park, with a heavily-treed and well-established garden. 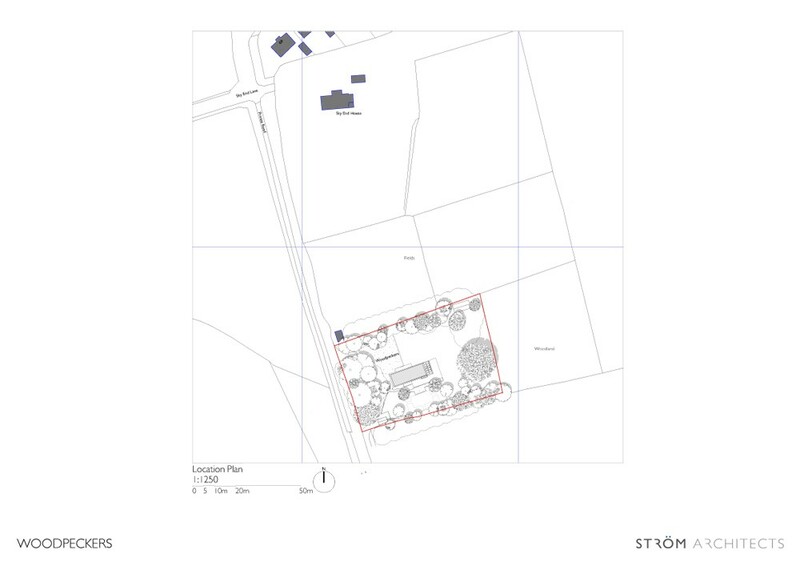 Building works started in August 2014 and the clients moved in at the start of July 2015. 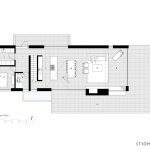 The clients wanted a comfortable contemporary home as a weekend house, which could eventually become their permanent home in the future. With busy lives in London, they needed somewhere to retreat to at weekend. As keen gardeners and enjoying the outdoor lifestyle, they wanted a strong relationship with the garden, as well as the surrounding countryside. 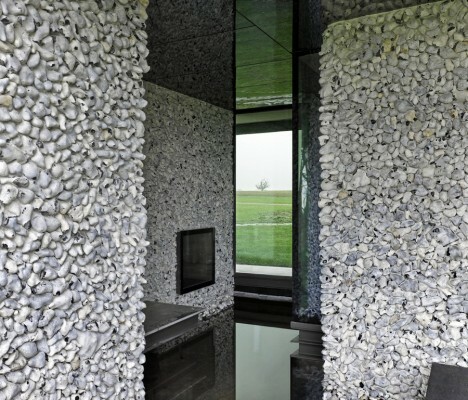 With the clients both involved in the design world, their aspirations for the aesthetic and build qualities were high. 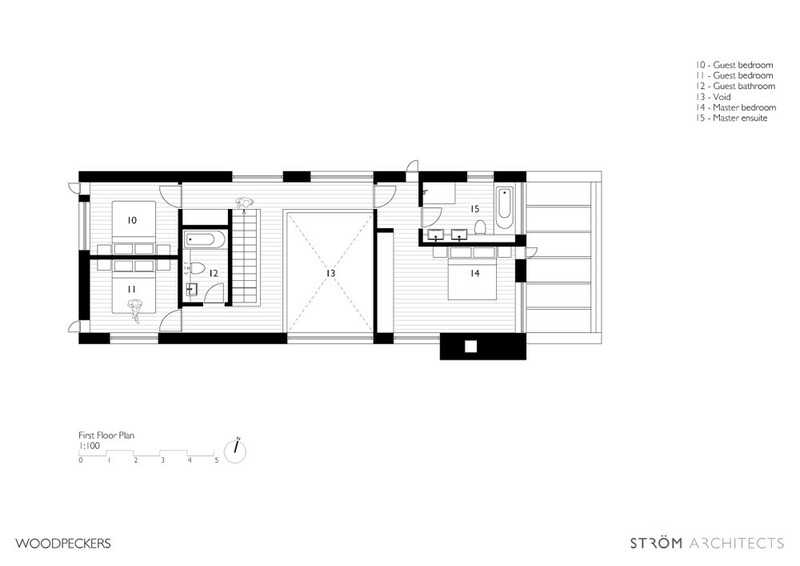 They wanted a house that would be simple, elegant, and robust enough to cope with two dogs and regular visitors. A tight budget meant that the architects found efficiencies in the building fabric and structure to offset the cost, as the quality of finishes and size of spaces were not to be compromised. Strom Architects established that for speed and cost reasons, it was best to adopt a timber frame for the house. 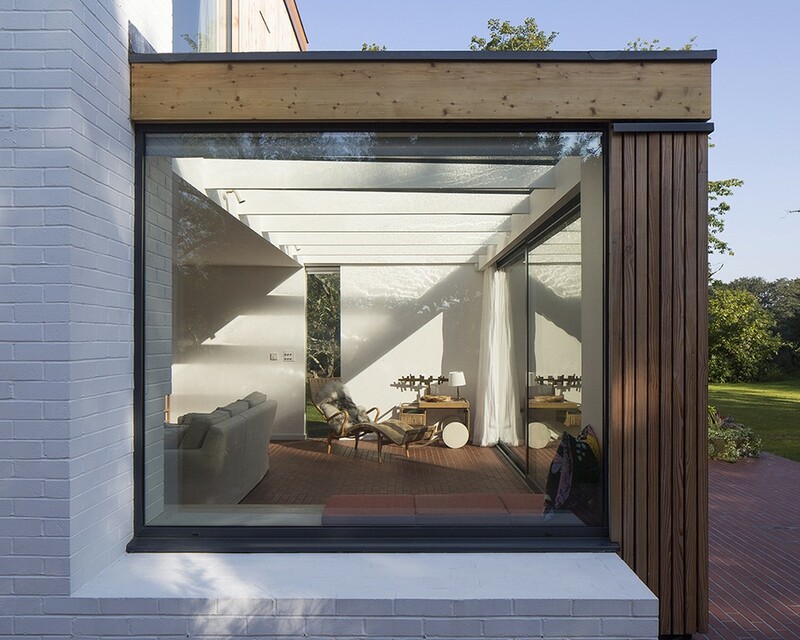 To create a strong internal-external relationship, large openings would be required – traditional masonry would have needed large amounts of steel to achieve these, which would have attracted costs, and diluted the simplicity of a singular structural strategy. 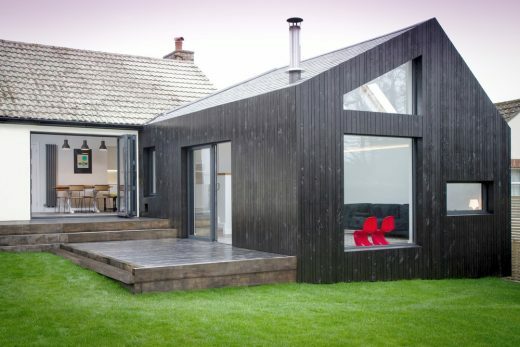 As it stands, the structure is entirely timber studwork, sitting on a piled concrete slab. 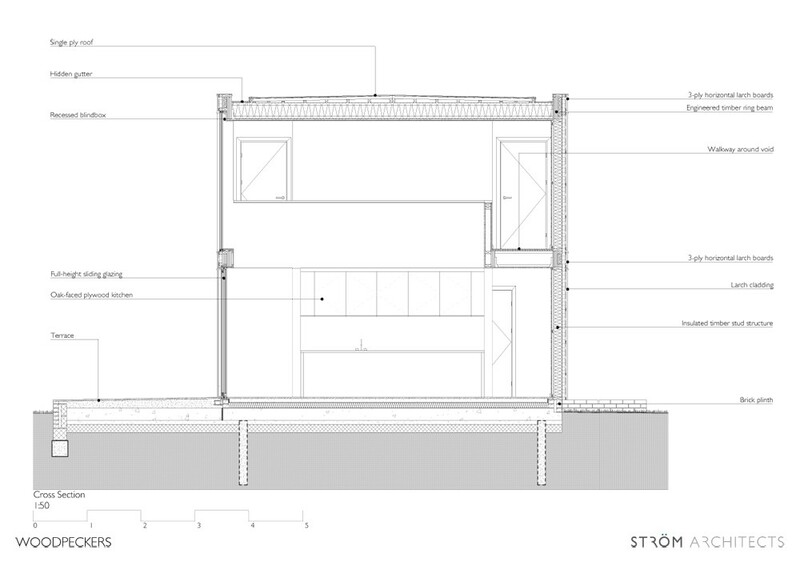 The studwork is filled and over-clad with insulation, creating a thermally- and structurally- efficient envelope. Planning constraints dictated a tight floor area, with an additional allowance for a ‘conservatory’. All overhangs were counted in the areas, so we established that a slab-sided volume would make best use of the restrictions, pushing glazing to the outer edge of the envelope. 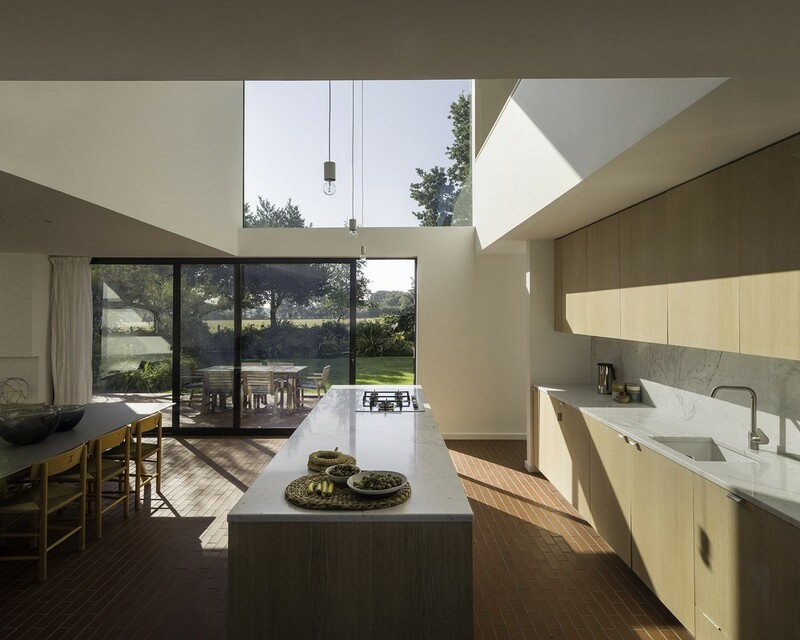 By integrating a single-storey flat-roofed glazed element, continuing out seamlessly from the main open plan space, the architects were able to eschew the typical aesthetic of a domestic conservatory. 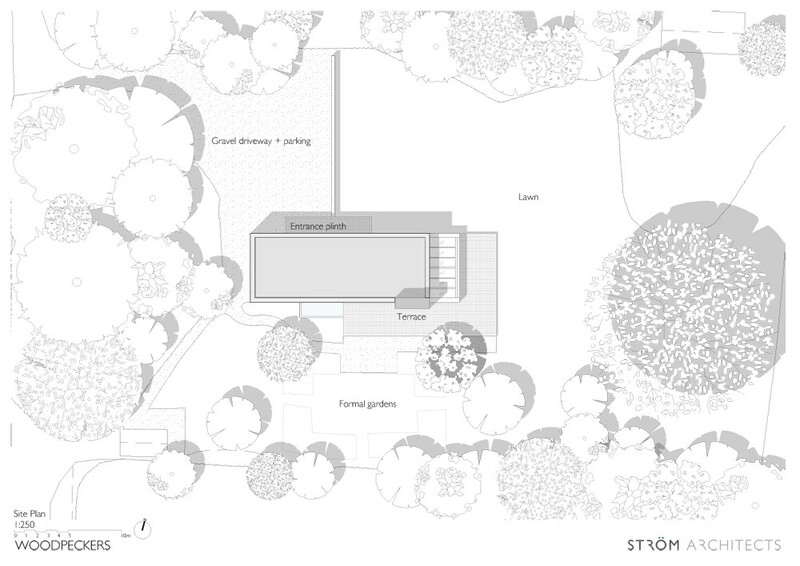 The driveway is to the North-West of the site, separated from the garden by a low wall and fruit trees. 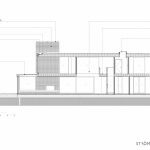 The house sits on a low brick plinth which provides a raised entrance area, as well as larger terraces around the house. The ground conditions mean that the gardens can suffer with boggy lawns at times. 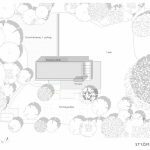 The plinth allows outdoor areas to be enjoyed regardless of waterlogging. 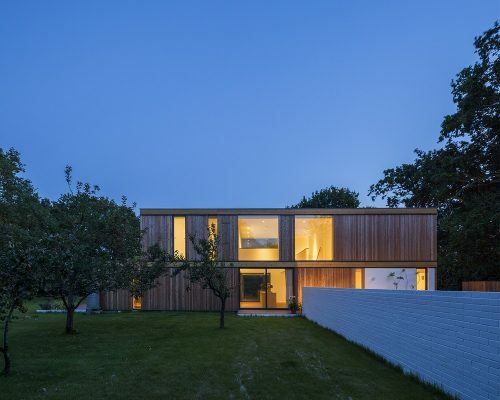 Above the plinth the house is clad in open-jointed untreated larch strips; wide horizontal bands of 3-ply larch boards are placed at first floor- and roof-level, to articulate the slab-sided façades and to express the timber floor plates within the structure. 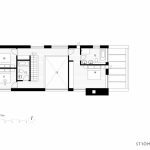 Inside, the ground floor is split into smaller ancillary spaces to the West of the entrance, with open-plan spaces to the other side. 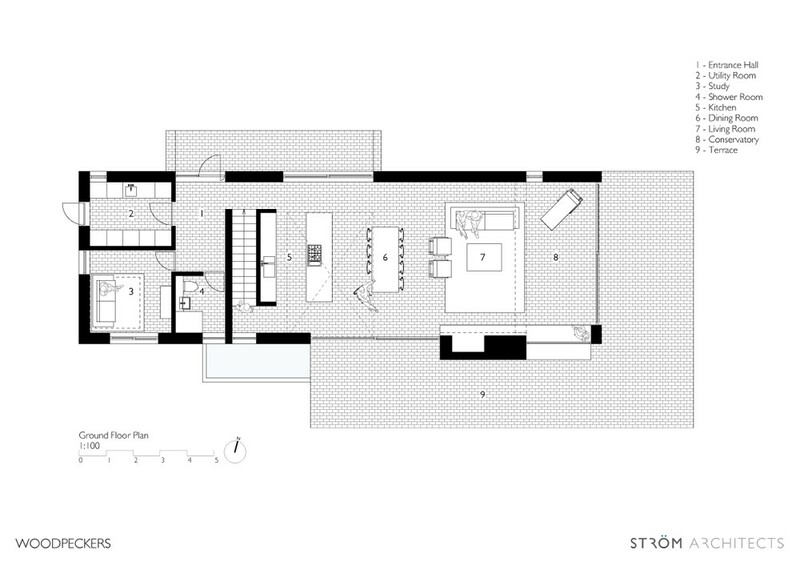 The kitchen is anchored in the centre of the plan, with the dining area adjacent to it. 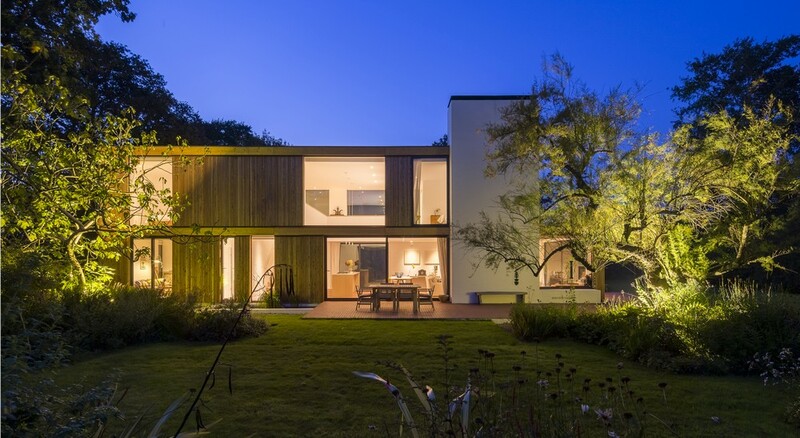 Terraces to the North and South give a relationship between the busy interior and the gardens beyond. A void at first floor provides additional height, giving a feeling of space and connection between floors. 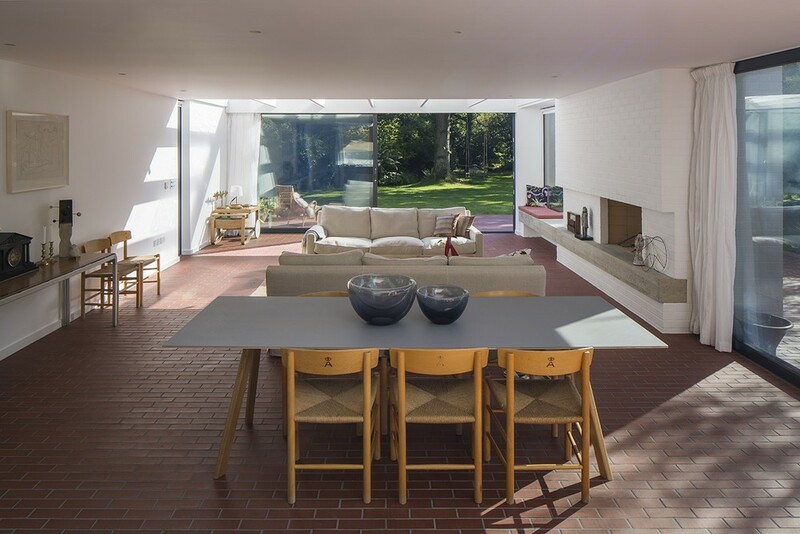 The living room and conservatory enjoy views of woodland to the East. An open fireplace – with a white-painted brickwork chimney and cast concrete hearth – gives solidity, and a focal point to this living room. 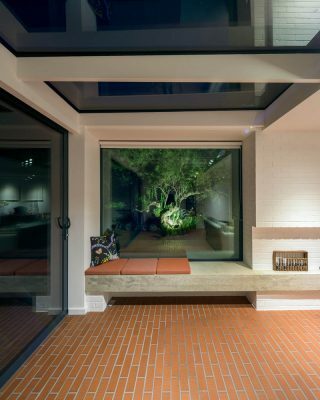 Brickslips are used as the floor finish, complementing the tactile qualities of the brick and concrete hearth; this floor finish continues out onto the terraces to give a seamless inside-outside feeling. 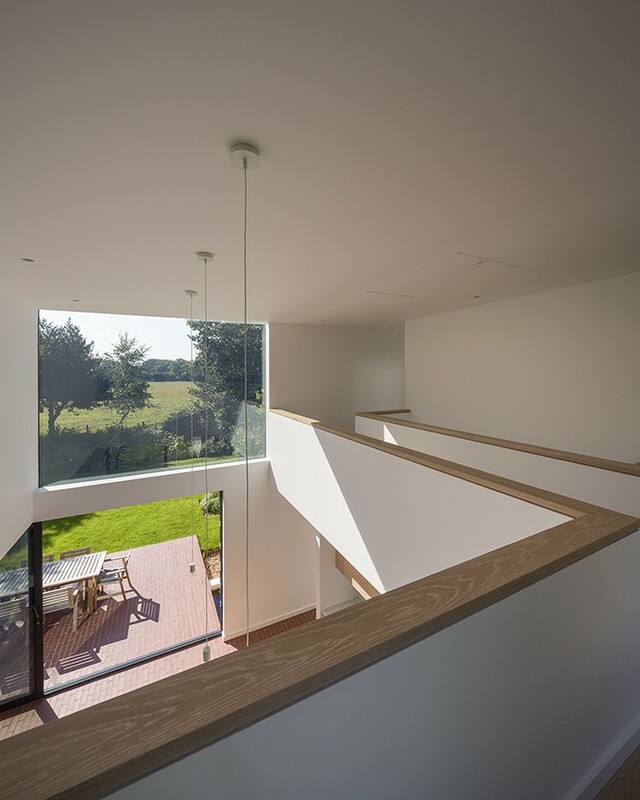 An open-tread staircase leads to the first floor level. 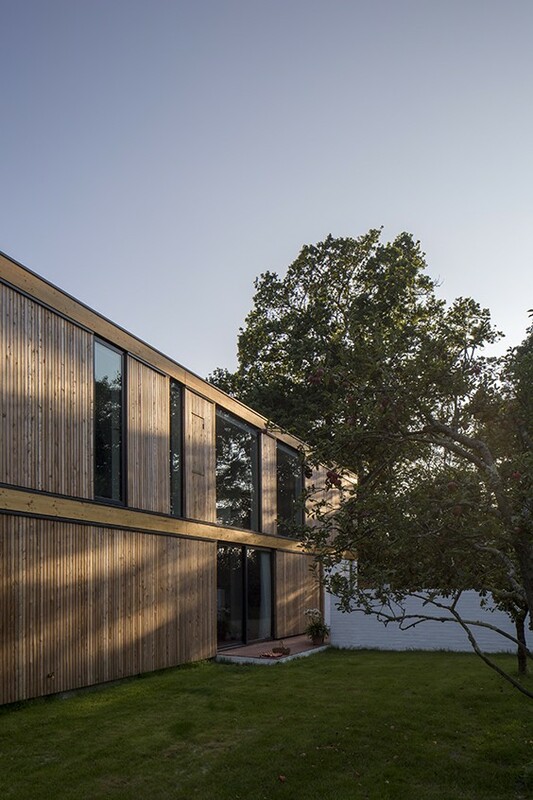 To the West is guest accommodation; the master bedroom is separated from these rooms by the void, and sits on the East side of the house to make the most of the morning sun. The relationship between the spaces and the sun was important to inform how and when spaces are used, as well as how they perform environmentally. 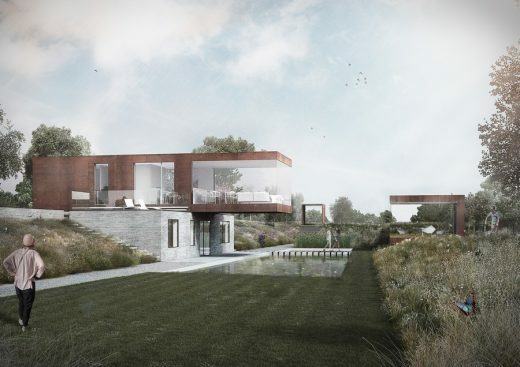 Strom Architects prefer to approach sustainability in a more holistic manner, ensuring that it is considered as part of the design proposals, rather than as an add-on after the design is completed. 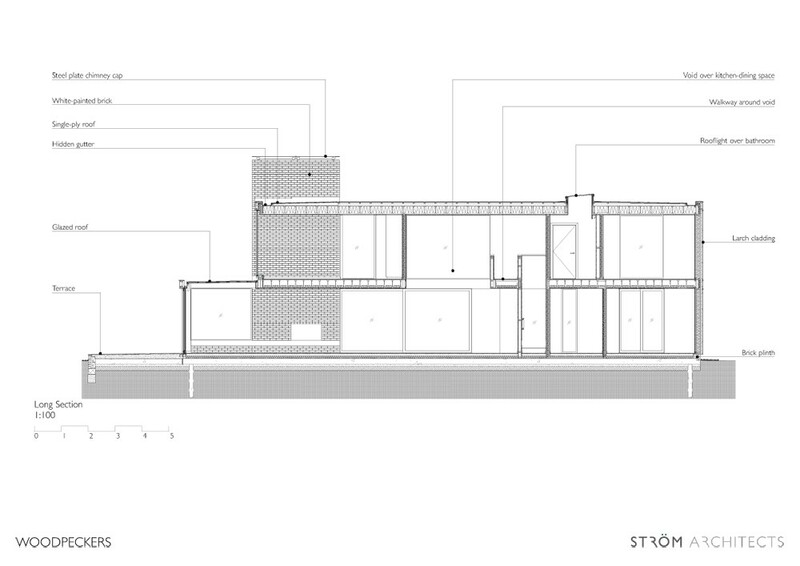 Strom Architects carefully considered sunpath, overshading, thermal mass and natural light when creating Woodpeckers. 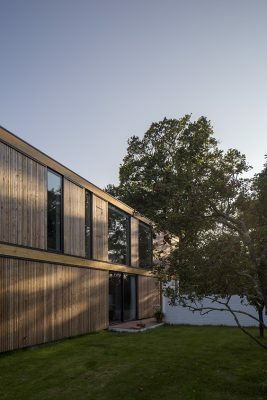 With a slab-sided house there are no overhangs to prevent overheating; however, the mature trees on site prevent excessive solar gain so additional cooling is unnecessary. The large windows and central void capitalise on natural light, lessening the need for artificial light. The brickslip flooring provides thermal mass to this lightweight house, ensuring that temperatures are kept even. Openings on the North and South facades provide cross-ventilation, and with the void above them this also allows ventilation between the floor. A system of passive vents provides background ventilation. 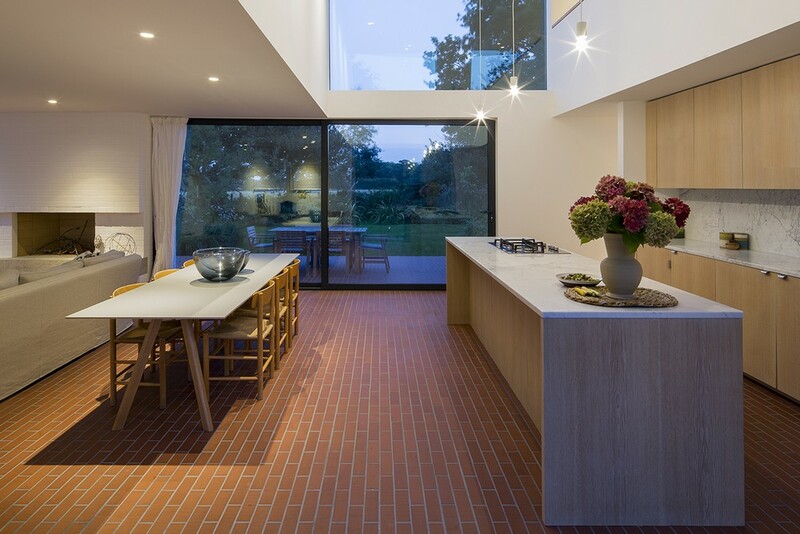 Underfloor heating at ground floor level is powered by an air source heat pump, lessening the requirements of gas heating, and is further supplemented by the open fire. Rainwater is dealt with in soakaways or collected for the garden. 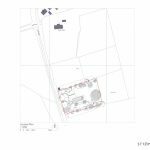 Foulwater is dealt with on site using a mini-sewage treatment plant, so there is little impact from the site’s occupation on its surroundings. Designed from the outset as a timber-frame, the dimensions of the house reflect maximum spans for standard engineered timber beams, utilising simple components with very little wastage from cutting. 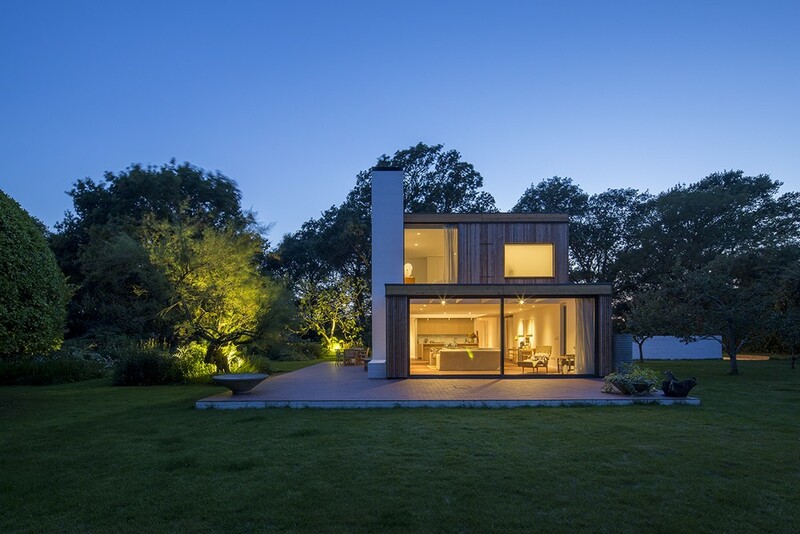 This approach of building more efficiently and simply is an important aspect of sustainability at Woodpeckers. 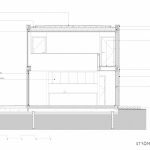 Purely superficial elements, inefficient use of space or overly complex detailing, require more building; this in itself requires more energy, processing and waste. By rationalising the plan and simplifying facades, we built sustainability concerns into the design. 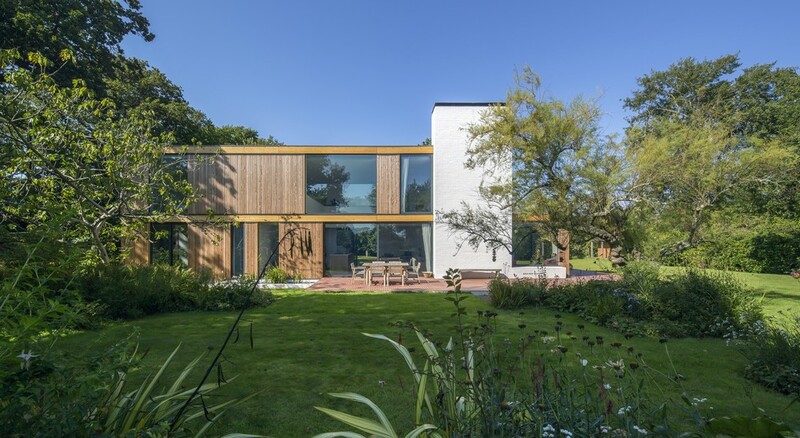 Initially envisaged as a house for the weekends, Woodpeckers has become much more to the clients, with them spending more and more time there – from long weekends, to weeks spent working from home and extended stays hosting family during the holidays.